There is little argument that Mac OS X and the Macintosh platform provide an elegant, powerful computing environment. 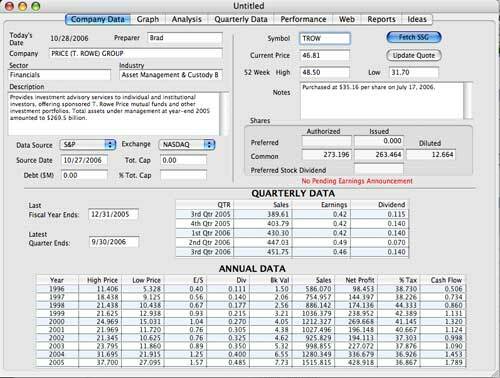 Churr Software was created to provide fundamental stock analysis tools befitting the Macintosh. If you are an individual investor who wishes to perform fundamental stock analysis, the the Stock Investment Guide (SIG) will suit your needs. If you are a member of a stock club, you will be able to share data files with your club members using the interchangeable .ssg data file format. Sure, you can enter data by hand, but that is almost like the days users had to use a ruler, calculator and graph paper to analyze public companies. SIG offers you several options to quickly and painlessly enter data. 1. SIG is fully integrated with NAIC's Stock Data Service (previously call Online Premium Service). The SDS is a separately available service through the NAIC (currently $25 for stock club members or included in the $50 individual membership). 2. SIG is also fully integrated with the data service provided by Stock Central. Stock Central currently has a 90 day free trial. An annual subscription costs $39. 3. Free data is also available to SIG owners. While this is not a complete data file, SIG can extract the minimum amount of data for a stock analysis from various web sites on the internet. Users must verify the validity of such data. This is a useful features for users that would otherwise enter data by hand, but not one that can be fully relied upon with the same confidence as the NAIC or Stock Central data services. All of Churr Software's products are Universal Binary, meaning they will run on both Intel and legacy Macintosh computers running OS X. We will lead you through all of the features of the Stock Investment Guide if you click NEXT. Otherwise, you can browse individual selections below.